To me one of the fun aspects of our hobby is the planning, specifically planning which kits to build and planning in what order to build said kits. I tend to build simil ar subjects in groups – I’ll try to do a few fighters in a row, than armor kits, etc. Right now I’m working on some bombers, and being the planner that I am, I have to admit that the Wellington was never in my plans. 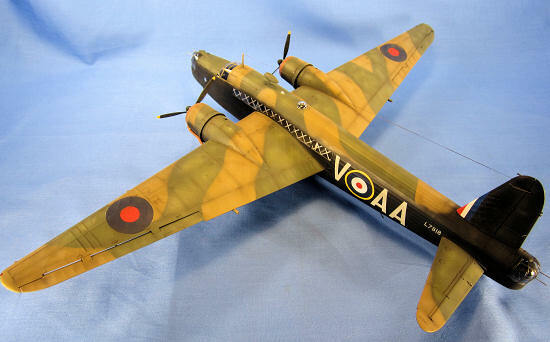 I simply had never heard much about it, and I’ve certainly never built a model of it before. While researching another bomber however I began reading more and more about the Wimpy. 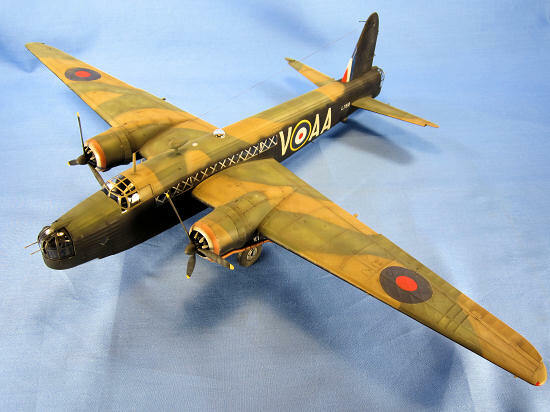 An unsung hero that was the primary British bomber during the early part of the war, the Wellington has always been overshadowed by its more famous four-engine cousins. Still, it deserves credit for its dogged early war service when it often fought through atrocious conditions at a time when bombing tactics were still in their infancy. Serving in roles it was never designed for, the Wellington was also the only British bomber that was in frontline service from the war’s beginning to its end. With over 11,000 built by war’s end, I decided to add a Wellington to my collection. I’d never built a Trumpeter kit before, and having read reviews of several different Trumpeter kits, it seemed like their quality was all over the map. I bought the kit and was dubious of what I was getting myself into, but upon opening the box my fears were began to subside. Several sprues of light gray injection molded parts, all individually wrapped in protective plastic, were just the beginning. The kit also provides a photo etch fret, white metal landing gear with metal axles, rubber tires, and a full color fold-out painting guide. An impressive ordnance load is included, allowing you to load out your Wellington six ways to Sunday. The clear plastic sprues, white metal parts, rubber tires, and photo etch fret are boxed in a separate cardboard box similar to what you’d find in a Tamiya 1/32 kit. Overall the impression is that this is a very high quality product. Wellington fans know well the story of Sgt. James Ward, the second pilot on a Wellington Mk. IC that was damaged by a Bf 110 night fighter while returning home from a raid in July 1941. His actions to help extinguish a fire in the starboard engine and thus save the aircraft and its crew are such that you wouldn’t believe if it weren’t true. I decided to model that aircraft, L7818 of No. 75 Squadron. Being that I can’t let a model go by without buying more stuff for it, I also purchased a resin exhaust set from Quickboost and a mask set from Eduard. If you enjoy modeling bomber interiors, you won’t be disappointed by this one. Trumpeter provides a full cockpit station, bomb bay, and the stations above the bomb bay; all nicely detailed. The geodetic framework pattern of the Wellington is nicely molded inside and out. I began with the cockpit, spraying the major components, bulkheads, and fuselage sides Flat Black and then picking out the individual details with a brush. Trumpeter provides a printed instrument panel which I glued to the back of the transparent instrument panel. I then masked off the dial faces with Micro Mask and then sprayed the panel Flat Black. I sourced some photo etch seat belts from my spares box, and moved on to the next assembly. The fuselage interior should be painted a brick red color to represent the fabric that it was covered with, and for that I used Tamiya XF-9 Hull Red. I then picked out the geodetic framework by hand with Testors Aluminum. The bomb bay interior was also sprayed Aluminum, and once all of the paint had dried I assembled everything together. There’s room for more detail on the interior (there usually is), but someone at Trumpeter must have a sense of humor, for they included the chemical toilet! The nose, ventral, and tail turrets are intricate little assemblies and are assembled next. They are also unfortunately painted all black, making it hard to see the nice details they contain. After that the engines are assembled next, and they are highly detailed assemblies as well. 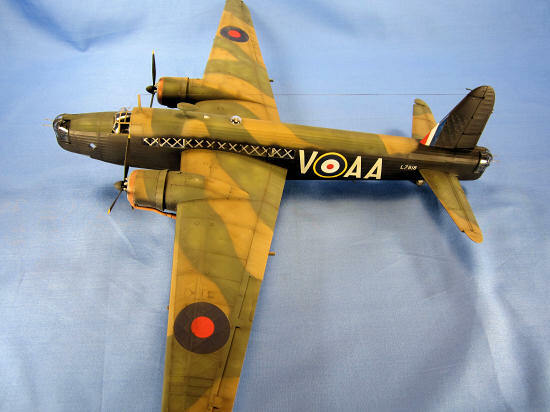 If anyone ever wanted to channel their inner Sheperd Paine and build a diorama of a Wellington undergoing engine maintenance, they wouldn’t need any extra aftermarket parts for the engines. Moving on, the next step was to add the interior modules onto one of the fuselage halves and then close them up. Keeping the turrets lined up in their grooves while closing up the fuselage halves was a little tricky, but once they were nudged into position there was only a minimal seam to clean up. I set that aside to cure and started the landing gear wells. Trumpeter provides nicely detailed photo etch panels to replicate the sidewalls of the wheel wells, and those glue to plastic pieces that once glued together, trap the white metal landing gear struts in between them. This sturdy wheel well assembly snaps in turn into place in the lower wing half. Before closing up the wings you have the option of moveable control surfaces and either closed or open landing flaps. I chose to keep my Wellington’s flaps closed, but left the control surfaces at subtle angles – one side up and one side down. The wing halves then go together nicely, again with a minimum of seam work. The same is true for the elevators and rudder, all of which have separate control surfaces – very nice! I angled my elevators downward to add some variation to the model. The engines attach to the wings next, followed by their cowls. You have the option of displaying the rear cowling flaps open or closed – I chose to leave mine open. Cruising right along, it was now time to attach the wings to the fuselage and here Trumpeter has come up with a clever solution. First you glue a box-like part onto the wing root portion of the fuselage. That part has a snap tab on it. You then slide the wing over that box part until the snap tab grabs and locks in place – which it does, quite nicely! Running liquid cement into the seam all around the wing-fuselage joint resulted in a rock solid structure, with no seams to clean up! I think that may be the first time in my model airplane modeling life that I’ve never had to fuss over that seam. The elevators attached to the fuselage nicely as well, needing only a quick swipe of Mr. Surfacer to cover a small gap. The last major part was the bomb bay door. Trumpeter gives you the option of modeling the bomb bay doors open or closed. If you wish to leave them open, you have to paint and glue on – I hope you’re sitting down – 30 different small doors. If you wish to model them closed, Trumpeter provides a single large part to cover the entire bomb bay. Yes, I went with the closed option. There were some gaps around that part, but none that couldn’t be dealt with. The Wellington has a plethora of transparencies all around it, and they were added next, all fitting nicely. After adding a few more small parts that I hoped to not knock off during the painting process I masked the transparent parts with the Eduard set, and the model was ready for paint. My first step was to wipe down the model with Polly S’s “Plastic Prep” and then airbrush a primer coat of Mr. Surfacer 1000 onto the model. After doing some minor seam touch-up work I preshaded the model’s panel lines with Tamiya Flat Black XF-1. 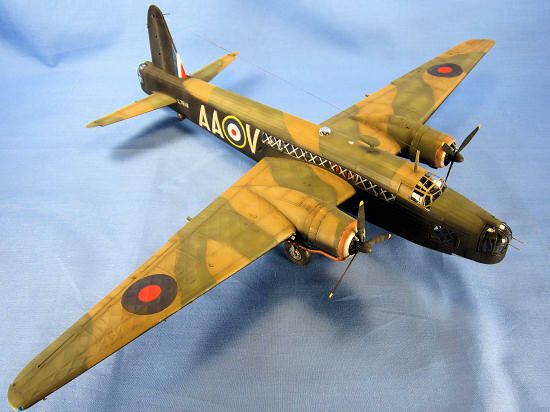 The Wellington I was modeling was painted for night-bombing duty, so that meant that the entire aircraft was black except for the tops of the fuselage and the wings. The first color to go on was the Dark Earth shade, and for that I used Testors Acrylic Dark Earth. I then masked that by looping pieces of Tamiya masking tape onto pieces of scrap paper that I had cut to match the Wellington’s camouflage pattern. With the edges of the paper held slightly above the plastic surface by the masking tape you’ll get a nice soft edge between the two colors when the next color is airbrushed. For the RAF Dark Green shade I stuck with the Testors line and used their Acrylic RAF Dark Green. I next removed all of the masks and subtly sprayed a lightened shade of each color in splotches onto the surfaces to provide a fading effect. Up next was the black, and I sprayed that free-hand using Tamiya XF-1 Flat Black. Using the profile of L7818 in the Squadron/Signal book as a reference, I brought the black fairly high up the sides of the fuselage, basically to the top of the fuselage windows. When that was finished I “splotched” some Tamiya XF-69 NATO Black randomly onto the black surfaces for some more fading effects. After that the obligatory Future coat was applied, and the model was set aside for a couple of days to cure. 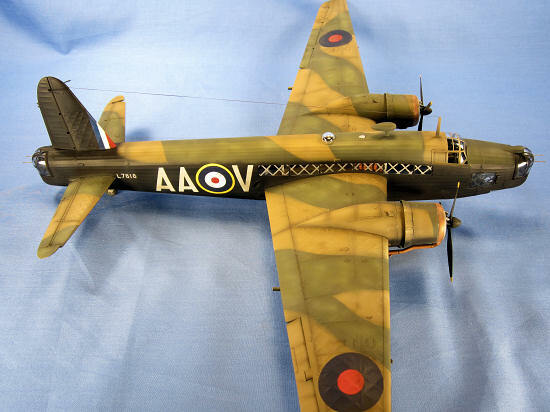 There weren’t many decals to apply, just the fuselage codes and roundels, the roundels on the wings, and the small serial code. Once they had set I sealed them with a coat of Future, and then applied a thin wash of Mig Productions “Dark Wash” to all of the recessed panel lines on the upper surfaces. With the lower surfaces being so dark, I didn’t apply any panel line wash to them. A coat of Testors Model Master Flat Finish was airbrushed on next, and then I brush-painted the wheel wells, wheel hubs, and landing gear with Testors Aluminum. I then masked off the tail to airbrush the red, white and blue fin flash that this aircraft wore at the base of its tail. Once that was finished I attached the rubber tires to the wheels and then the wheels to the landing gear using the tiny metal axles the kit supplies – very sturdy! The next weathering step was to airbrush a very thin mix of 50/50 Tamiya XF1 Black and Tamiya XF64 Red Brown over all of the panel lines and engine exhaust areas. This is an effect I’ve really grown fond of and on this model I tried a technique that I read about in a modeling magazine. To get a grease streaking effect from a seam, just cover the forward part of the seam with a piece of scrap paper, and then airbrush a light streak from the seam towards the rear of the airplane. You’ll get a nice streak that has a defined “source”, like a greasy control surface hinge or similar. Moving right along I removed all of the window masks next. I thought about doing some subtle dry-brushing to bring out the geodetic structure that Trumpeter molded into the surfaces, but decided that it looked prominent enough as it was. I added some paint chips on the leading edges of the wings and around the engines using a Silver Berol pencil and then gave the wheels, wheel wells and landing gear a wash using Mig Productions “Dark Wash”. All that was left to do was to paint the wingtip lights and then add the props and machine gun barrels. Once that was done I used EZ Line for the antenna leading from the mast to the tail, and the model was done. This is a fantastic kit, one that I enjoyed building from start to finish. The kit engineering is superb with plenty of detail and no major assembly issues to deal with whatsoever. One cannot quibble with what Trumpeter provides in the box, or the number of options they give you with which to build your Wellington. They really put a lot of thought and effort into this kit, and the modeler reaps the reward with a fun, fast, and trouble-free build of a fairly big bomber.